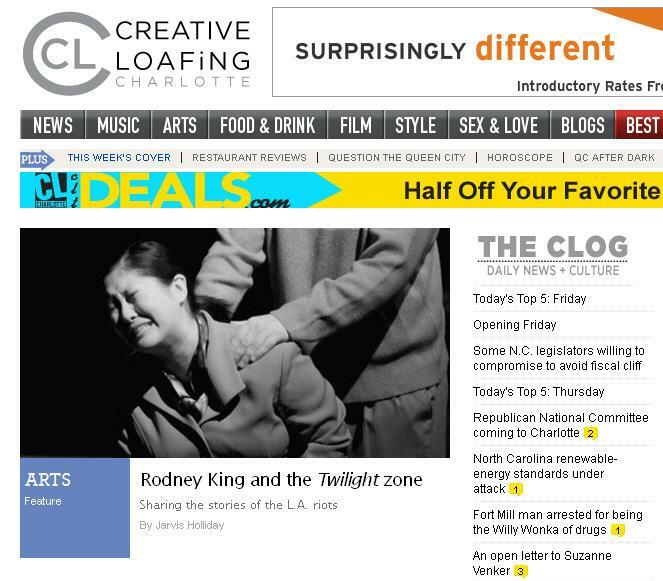 Check out this week's issue of Creative Loafing for the feature I wrote, titled "Rodney King and the Twilight zone." It's about On Q Productions' presentation of Twilight: Los Angeles, 1992, on stage through December 8 at Duke Energy Theater at Spirit Square. The Tony Award-nominated play by Anna Deavere Smith tells the story of the infamous Rodney King beating by LAPD officers, their trial, acquittal, and the subsequent riots by citizens of L.A. that lasted six days, leaving nearly 1,600 buildings damaged or destroyed and 53 people killed. I was in middle school when the riots happened in 1992. I remember vividly watching the round-the-clock news coverage, the racial tension it caused even where I lived in South Carolina, and the disbelief that all of this was even going on. Up until that point, I think my generation believed that the days of mass racial violence in this country had ended with the Civil Rights Movement, and that it was something we only experienced in history books and documentaries. In the article I wrote for CL, not only did I interview the directors of the play for On Q, but I also talked to a law school professor who helped put the whole juxtaposition of race and the justice system into perspective.